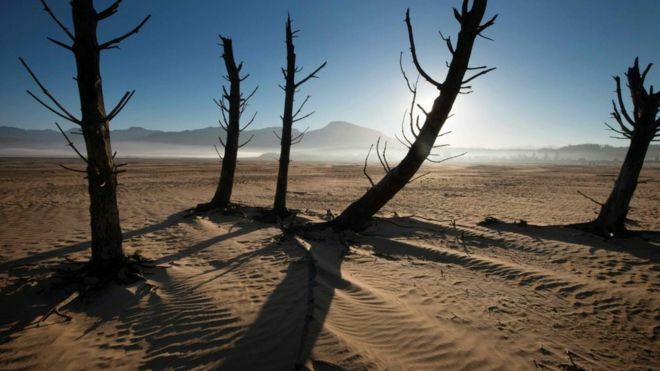 South Africa has declared the drought which has seen Cape Town hurtling towards "Day Zero" a national disaster. The government made the announcement after reassessing the "magnitude and severity" of the three-year drought. It has badly affected three of the country's nine provinces. The decision came as Cape Town announced its water saving measures, which require each citizen to use less than 50 litres a day, had successfully pushed back "Day Zero" to 4 June. Just a matter of weeks ago, the date that Cape Town's taps were predicted to run dry was 12 April. Mmusi Maimane, leader of South Africa's Democratic Alliance (DA), which runs both the city of Cape Town and Western Cape province, tweeted:In another tweet, he revealed the average water use in Cape Town, a city of about four million people, was below 550 million litres. Two years ago, it was at more than a billion litres per day. It has been no easy task for Cape Town's residents. The 50 litre limit is just enough for a very short shower and one flush of the toilet a day when other needs - including just one load of the washing machine a week - are taken into account. Des van Rooyen said last week more than 70m rand (£4.2m; $5.8m) had been put aside to tackle the crisis in the Western Cape, as well as in the Eastern Cape and Northern Cape, two provinces which have garnered less headlines, but are also struggling with the effects of the drought.